Discover the enchanting essence of authentic French home cooking with the man who introduced us to it. Fifty years ago Rick Stein first set foot in France. Now, he returns to the food and cooking he loves the most ... and makes us fall in love with French food all over again. In ... read full description below. Discover the enchanting essence of authentic French home cooking with the man who introduced us to it. Fifty years ago Rick Stein first set foot in France. Now, he returns to the food and cooking he loves the most ... and makes us fall in love with French food all over again. In search of the new French Idyll, Rick's meandering quest through the byways and back roads of rural France sees him pick up inspiration from Normandy to rural Provence. With characteristic passion and joie de vivre, Rick serves up incredible recipes- Normandy salt marsh lamb, tender, flaky fresh water sole from the fishing port of Picardie, p tes bursting with flavour, and a recipe for the most perfect Madeleine plus much, much more. France is the culinary cradle of Europe, blessed with exquisite food and wine, and it's born a generation of classical cooks. We think we know French cooking, but we are about to discover true, rustic French cooking- simple fare, wonderful ingredients, all perfectly assembled. 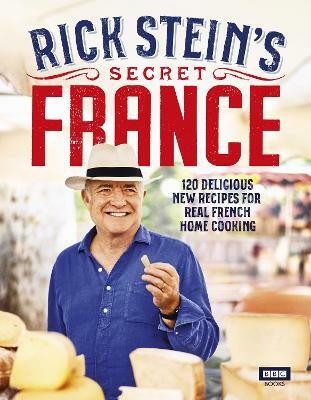 In Secret France, Rick goes off road through hidden towns and sleepy villages to discover the true heart of the enchanting country that had the biggest influence on his cooking. Through vibrant, fresh and uncomplicated recipes he finds the true essence of a food so universally loved, and far eaiser to recreate than you think.